IT is the aim of the Levin Bridge club to foster an atmosphere where bridge can be played and enjoyed by all, without unpleasantness caused by poor etiquette or bad behaviour. Listen to directors/session leader’s instructions and notices. Greet others in a friendly manner prior to the start of play of each round. Make the necessary effort to make bridge enjoyable for yourself, your partner and your opponents. Avoid the use of language that others may find offensive or even socially unacceptable. Ensure that your mobile phone or any other type of communication device is switched off. Try not to do anything that might annoy anyone, and stop whatever it is if anyone suggests that you are annoying them. Talking during the bidding or play of the hand, with the exception of requesting an explanation of bids. Negative and/or sarcastic comments concerning opponents’ or partner’s play or bidding. Gratuitous lessons and analyses at the table. However, if someone asks for help, it is acceptable to offer suggestions. Conduct that is less than polite. Criticising your partner or your opponents in public. Any loud or disruptive behaviour. Arguing or raising voices with partners, opponents, or, Directors. Being rude, sarcastic, belittling, insinuating, intimidating, profane, threatening or violent. Snapping or slamming cards on the table, or any other emphatic play of the cards that is designed to stress a point. Talking to a person in an aggressive, loud or threatening manner. The Levin Bridge club has two recorders, essentially one for the junior room, and one for senior members. The recorders are appointed annually by the committee. Are serious but there is only an implication of wrongdoing without substantial evidence to bring a formal complaint to the Director or the Committee. It is important that such instances are reported to the Recorder to ensure that appropriate action is taken and the game of bridge is made more enjoyable for everyone. The recorder will address the complaint by counselling and/or education and in confidence with the parties. Recorders may request the committee to assist if they consider that confidential negotiation has not reached a conclusion satisfactory to members involved in the complaint. Establish suitable conditions of play for the session. To maintain discipline during play and to ensure the orderly progress of the game. The laws of bridge are designed to define correct procedure and to provide an adequate remedy when a departure from correct procedure occurs during the bridge session. They are primary designed not as a punishment for irregularity but rather for the rectification of situations where non offenders may be otherwise damaged. Members should call for the director if irregularities occur during play, as they not the players have the responsibility of rectification. The committee is responsible to adjudicate on any matter of harassment, bullying, or disturbance of the peace that occurs in the boundaries of the club premises, referred to it by Club members or Club Recorders. The committee will appoint the club president and, two non-committee club members who they consider will best be able to negotiate a solution to the specific problem, to form the disputes panel. The panel will attempt to resolve the matter by consultation and negotiation. 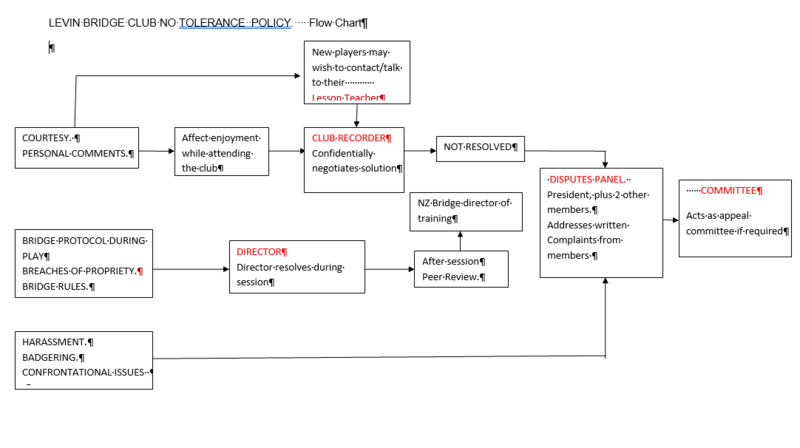 If the panel are unable to resolve the matter, or if after consultation and negotiation, are of the opinion that a club members conduct is sufficiently significant to effect the well being of the club or the playing of bridge they will refer the matter along with records of their consultation and conclusions to the club committee. The committee will be required to consider the recommendations in a manner as defined in the Levin bridge Club Constitution section: Discipline and/or Suspension or Expulsion of members.